What will the world look like in the next quarter of a century? What role would water play especially in terms of global conflicts? Though it is rather difficult to predict or provide precise answers to these questions, we think three factors would play a decisive role—globally and also within countries and regions. These three factors are: climate change-induced uncertainty, increasing urbanisation and industrialisation, and a more conservative political system. All the three factors have implications for water—how much water we would have, how much we would use, how water would move from one use to the other or from one region to another, how it would impact the water that comes back from the uses as “return flows” and water quality, and, finally, how all these would either exacerbate or give rise to new conflicts. The world is moving to increasing uncertainties and climate change is the single most important factor for this. Extreme weather events resulting in increasing droughts and floods is a sign of this. Climate predictions indicate that most countries are heading for water scarcity of varying degrees. Stationarity, long-term averages and predictions about river flows and water availability—the basis of most transboundary river-sharing—may not work any longer. Only 2 per cent of our total water is freshwater and only a fraction of this is utilisable. Climate change, especially global warming, will keep impacting the availability of freshwater in the world. Melting of glaciers because of global warming will suddenly increase the flows of some rivers or storage of glacier lakes causing flash floods. Warming also increases evaporation of water from larger water bodies like lakes making surrounding regions dryer every year. This has serious implications for the availability of freshwater in the future which will make access to freshwater even more competitive. The World Resource Institute (WRI) has come up with a map that captures country-wise water scarcity scenario. WRI found that 33 countries face extremely high water stress in 2040. Chile, Estonia, Namibia and Botswana could face an especially significant increase in water stress by 2040. This would increase the vulnerability in these countries across sectors such as industry, agriculture and, more importantly, liveli-hood needs of communities. Geo-political relations are going through a transitional shift in the world. Wherever water resources such as rivers or lakes are transboundary in nature, the nation states that have stakes over these resources are coming into conflict to protect their rights. Though historically downstream countries/states, especially delta regions, started appropriating water much earlier as compared to the upstream countries/states, the upstream countries/states have also started developing the water resources in their territory using locational advantages. Until these upstream and downstream countries form cooperative alliances and have a dialogue instead of disputes, there is no way that conflict situations over water can be handled without violence. Water also plays a strategic role in West Asian countries which are already water- stressed and the region will further face water scarcity. It is predicted that future of the already volatile region will be challenging. Similarly, in the conflict-prone zones of Syria, water scarcity and droughts will add to the problems faced by the war-ridden country. Current demographic shifts indicate that we would have a more urbanised world over the next 25 years. Already more than half of the world’s population lives in big cities and the number is increasing since more people keep moving to the cities. Coupled with this is the trend towards increasing industrialisation, especially in the developing countries, because industrialisation is the route being promoted for higher economic growth. China and India, the two most populous countries, are leading this trajectory of “development”. But urbanisation and industrialisation have implications not only for total water use, but also for intersectoral use, because it is likely that more and more water would move from rural to urban and from agriculture to urban domestic and industrial water uses. Also, it has implications for the “return flows” these uses generate in terms of both quantity and quality. Such shifts in water allocations and use would have implications for the livelihoods of people. Rapid growth in populations will lead to increasing consumption of water resources for industrial use and for basic human requirements. The limited resources and increasing demand have already led to contestation, conflicts, and challenges over local water management mechanisms. The large-scale migration to cities creates pressure on the available water resources, and in the absence of economic resources this migrated population ends up in slums. Population displaced to make way for large development projects and without any compensation by the government also resides in slums losing their indigenous, rural identity and free access to resources. These growing urban slums also pose a challenge to water governance in terms of providing access to clean water to the slum dwellers. Women’s struggles for access to clean and safe water in Korail, one of the largest slums in Dhaka, Bangladesh, is one such example where the water stress and privatisation created contestations over scarce resources. This is also true in case of cities like Mumbai in India which have implemented a neo-liberal development agenda of increased commercialisation of basic services, endangering the access of people in slum areas to clean water. Urban areas in developed and developing worlds are extremely water-intensive. Rapid industrial growth and increase in urban population compel metropolitan governance to reduce stress by encroaching upon periurban areas. This often results in a conflict of interests over the use of water. In the process of expansion of cities, periurban areas lose their traditional agrarian identity without acquiring an urban identity; they lose their traditional liveli-hood options without getting the benefits of urban infrastructure. 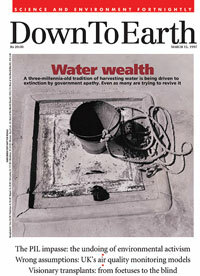 The literature on urban water governance or the water-power nexus does not mention the peri-urban areas in the cities. Peri-urban areas have some distinct issues about water and power circulation. In cities like Chennai in India, the water crisis is reduced through water supply in tankers from the peri-urban areas. These tankers are filled with groundwater which was initially used for agrarian activities. The people from peri-urban areas have no voice to resist this water “circulation” which adversely affects their livelihood. This could sharpen inter-sectoral conflicts. This would be more pronounced in the developing world, and in India this is already visible. Political developments the world over and the election results in recent times indicate that we are moving towards a more conservative and right-leaning political system. Historically, ruling regimes have used “nationalism/patriotism” as a major plank to evoke popular sentiments to tide over economic and other internal crises and also get legitimacy for their agenda. In many parts of the world—as in the case of the US, India and Britain—this is happening and neo-liberal economic agenda and nationalism are pushed together. There would be increased thrust on commodification of natural resources, including water, by using pricing as a mechanism for both allocation and recovery of investments and to generate surpluses. More and more people might get priced out of water services and mega infrastructural projects. The right-wing regimes thriving across the world would reduce the space for defending right to water for marginalised communities. We can see that protests and resistances are already being suppressed in India. Everything would be justified in the name of nationalism and patriotism. This would lead to tensions and conflicts, or exacerbate existing geo-political tensions (both bilateral and regional)—water would be used to settle scores. In many cases, water scarcity develops in regions where geo-political tensions and history of animosity exits. West Asia is a case in point where water and other geo-political factors have always worked in tandem to create situations of conflicts and wars. Some of the recent statements of the political leaders indicate this: “Blood and water cannot flow together,” said Prime Minister Narendra Modi in the context of the Indus Water Treaty between India and Pakistan, as tensions between the two countries escalated recently. The pronouncements of the US President Donald Trump about climate change in general and water in particular are a cause of concern for its neighbours, especially Canada. We conclude by arguing that water is going to be an important factor in global conflicts. But doomsday predictions will fortunately not materialise. Instead, there would be more conflicts/tensions regionally or bilaterally between riparian countries over sharing because water would be used to settle other conflicts and tensions. There would also be conflicts and tensions within countries (between states and regions) because of neo-liberal policies, urbanisation and industrialisation and increasing scarcity to name a few. Can modern India take a page or two out of the traditional water manager’s unwritten manual on settling disputes? IN TRADITIONAL WATER MANAGEMENT, innovative arrangements ensure equitable distribution of water. Such arrangements are democratically implemented: the gram sabhas or farmer committees usually approve these plans publicly. The traditional managers play the role of a tribunal authority. In Almora district, two villages share irrigation water in rotation. Upstream Ladyura and downstream Beyala used to have lots of conflicts over water-sharing. In 1944, the high court ordered that Ladyura would get water from sunrise to sunset and Beyala would get water throughout the night. But Beyala complained that during summer, Ladyura got more water because the days were longer. Later, the villages reached a decision with a water manager’s help: these two villages have now settled on a 12-hour rotational sharing of water. Bayala gets the water from 5 pm to 5 am; after this, comes Ladyura’s turn. The job of chowkidar Diwan Singh of Beyala is to acquire water from Ladyura by requesting farmers to block field outlets and let water flow downstream. Residents have formed co-operative farming system where each farmer owns land. Shib Singh Negi, Ladyura’s chowkidar, says the system has been in place since 1952, when the gram sabha formed an irrigation committee and handed over the task to the manager. Using unique modes and basic engineering skills, our traditional water harvesting structures demonstrate the people’s ingenuity at its best. 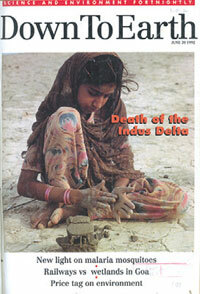 Starved of fresh water and no longer able to withstand the encroaching Arabian Sea, the Indus is dying a slow death. The destruction of the delta is a direct consequence of the dams and barrages built higher up on the river. These have diverted the river’s water into areas that were earlier rainfed, drastically reducing the quantity of water flowing into the deltaic channels.